My wishes for warmer weather have finally been answered - today is the first day we've had in weeks where the sun has stayed out and the breeze is nice and warm. It felt so good to be outside that I actually willingly went for a brief run around the park near my apartment when I got home (trust me, it's been a long time since I've done that!). 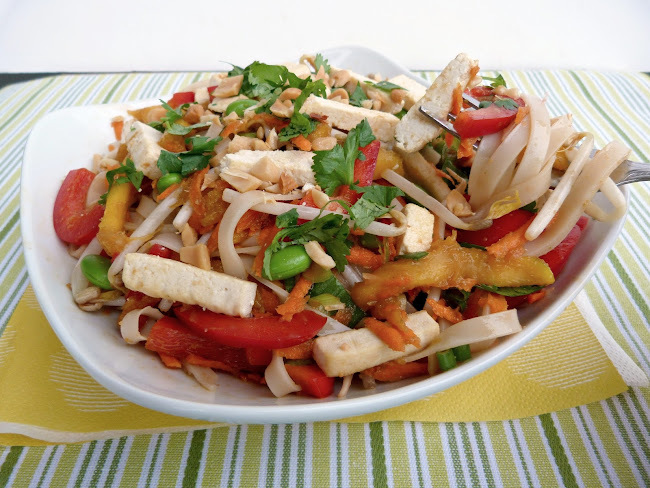 The recipe that I have to share with you today is perfect for this weather - a big salad made with rice noodles and full of fruit, veggies, and some tofu for protein, all coated in a spicy pineapple dressing! The recipe comes from Vegetarian Times, although I made some changes as usual. I was actually inspired to make it because it called for green curry paste, and I still had some homemade green curry paste leftover from the Thai Green Curry that I made a while ago. Along with the curry paste, the rest of the dressing is made by blending pineapple juice with other Asian ingredients like soy sauce, ginger, garlic and rice vinegar. For the salad, I used the red pepper and carrot that the original recipe called for, and I also added bean sprouts, mango and edamame beans. Since I wanted this to be filling enough to serve as a main course for dinner, I added some tofu that I sliced into thin pieces and sauteed briefly on the stove. The dish is finished off with a generous sprinkling of fresh cilantro, some hot chilies, and a handful of chopped peanuts. The result was a very colourful plate with lots of flavour! I also liked that it tasted good warmed up, at room temperature, and straight from the fridge. I did find it pretty spicy, so feel free to reduce or eliminate the extra red chilies. I also think fresh pineapple would work well instead of mango. I hope you're all enjoying the warm weather too... I'm off to make another big salad for tonight's dinner! Place all ingredients for the dressing in a blender and puree until smooth. Set aside. Place the rice noodles in a bowl or saucepan and cover with boiling water. Let sit for 5-10 minutes, until the noodles are soft (check your package directions – mine needed at least 10-15 minutes). Drain and rinse with cold water. Transfer noodles back to the bowl or saucepan and toss with 2 tsp vegetable oil. Meanwhile, prepare all the vegetables (red pepper through to chilies) and transfer them to a large bowl. Set aside half of the cilantro for topping. Slice the tofu into thin strips. Heat about 1 tsp of the vegetable oil in a large skillet on medium heat. 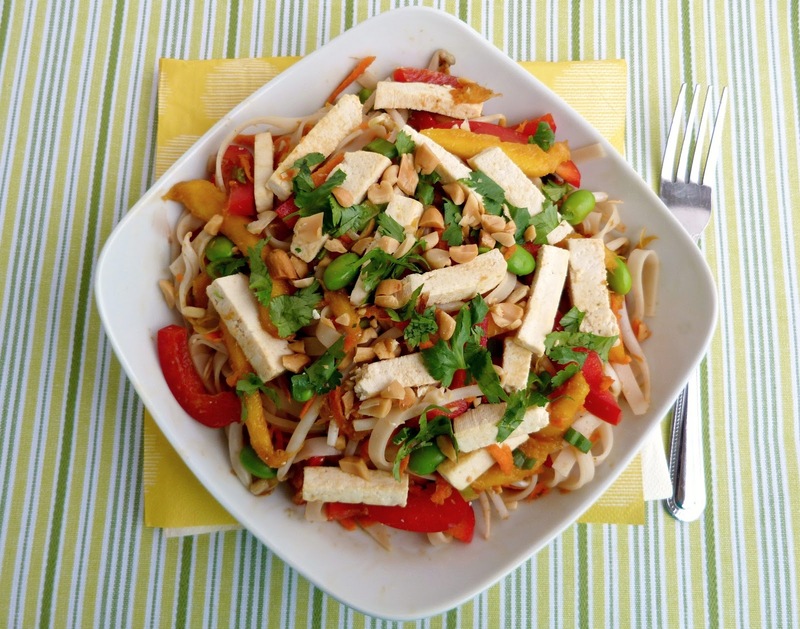 Add the tofu pieces and sauté for about 4-5 minutes, stirring often, until lightly browned. Combine the noodles with the vegetables. Pour about half of the dressing on top and toss to mix thoroughly, until all the noodles and vegetables are coated. Add the tofu pieces and pour a bit more dressing over top. Stir to mix again. Add more dressing if necessary (you might not need all of it). Serve immediately, or place salad in the refrigerator to chill until serving time. Garnish each serving with the remaining cilantro and a handful of crushed peanuts. I love the sweet and spicy combination in this dish, the flavors sounds amazing! Thanks! There were a lot of ingredients involved, but I loved the way they all came together! The dressing sounds incredible. Love the idea of using pineapple juice as a base for the dressing. Cilantro, edamame, mango, curry.....so many of my favourite things!!!! Looks fantastic! Thanks Courtney! The dressing did turn an ugly brown colour once it was mixed together, but it tasted really good! This recipe actually came from an old Vegetarian Times magazine - I just found it online. The one that I made from the special edition is still coming up! I know what you mean - even if there's a great dressing on the noodles, I still like to have something else mixed in. I sometimes go a bit overboard with adding tons of "extras" to my salads because I like each bite to be interesting! I wish I'd been here to try this - it looks so colourful and tasty!